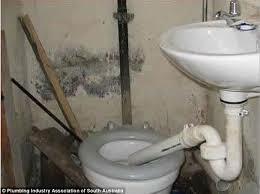 Toilet-installation, to many folks, seems like a daunting task with a high “ick” factor! Actually, installing a toilet is quite simple and not “icky” if you take certain initial steps. Remove the water supply from the underside of the tank where it connects to the fill valve. Check the condition of the water supply line. If you even think it may be old or in bad shape, install a new one. Make sure it is the “no-burst” type. Look at the right picture. This is a bolt cap. If you see them on both sides of the floor, just pop them off with a small screw driver. Then remove the nuts from the bolts on both sides of the bowl. Now the old toilet is ready to pull off the floor. Now, THIS IS IMPORTANT!I do not want to see you get hurt during your toilet-installation! 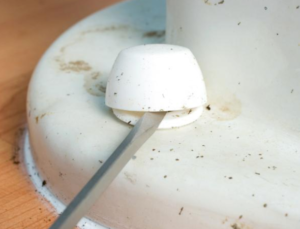 Any fixture made of ceramic can turn into sharp shards of ceramic pieces if shattered. You can suffer severe cuts if you drop the toilet and it shatters! I strongly recommend that you have somebody help you to lift the toilet and take it to its final resting place. You should also use an old absorbent towel or rag to “mop” out the water that remains in the tank and bowl. This takes away a little weight and keeps water from splashing out all over your beautiful carpet as you carry it. The water that remains in the bowl, if the toilet is tipped while your carrying it, will flow out of the bottom opening of the bowl. This will p__s off your wife/hubby/roommate to no end! Avoid it! You want this toilet-installation to be a happy event! Mainly, BE CAREFUL! Once you have removed and disposed of the old toilet, you will see the closet flange, as in the picture above right. The old bolts will still be in it. A new set of bolts and a wax ring should have come with your new toilet. If not, buy ’em. Remove the old bolts, scrape the old (icky! )wax off the flange with a wide scraper and install the new bolts. The bolts should tighten down on both sides in the flange slots with a washer and nut. They should be centered at the middle of the flange and directly across from each other. Now take the wrapping off the new wax ring and lightly place it on the center of the flange between the two bolts. 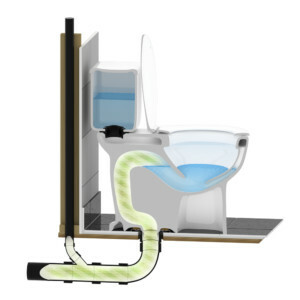 Unless you purchased a one piece toilet, which we will cover on this page, you’ll need to install the tank onto the bowl, as described on the tank to bowl page. Once your new johnie is assembled, install the new seat. New toilets rarely (if ever) come with seats. So, unless you just plain want to use your old seat, don’t forget to buy one. They come in “elongated” and “round” sizes, so make sure the seat matches your new toilet. The seat will come with the hardware necessary to attach it to the two holes by the tank on the bowl. Now, carefully (again, with help!) pick up the new toilet and set it straight down on the pre-installed bolts. Press firmly down on both sides of the toilet and make sure it’s straight and doesn’t “rock”. If it rocks, go get a common item known as toilet (closet) shims. Any decent plumbing supply store or even hardware store will have them. Rock the toilet and notice where the low spot is. This is where the shim(s) will be placed. Try to get the type of plastic shims that are “graduated”, or “stepped up” from thin to thick. Push the shim into the low spot until it “sets” and keeps the toilet from rocking. Then pull it out, take off the part that you don’t need (the part still sticking out from under the toilet)and reinsert it so that its tight and hidden from view. Now put your plastic cap flange on each bolt (it will say which side goes up), then the metal washer and then the nut. Hand tighten both nuts alternately and then snug them down until you see the plastic cap flange start to “squeeze” out. Check the toilet for firmness to the floor. If you must tighten more, do it on both sides and a little bit at a time. Once the toilet is firmly set, use a hacksaw (a mini-hack is easier) and cut the bolts straight and about two threads above the top of the nuts. Now your new bolt caps will “snap” right into place with a firm push onto the plastic bolt flange. Now, turn your water on at the angle stop (first installing a new water supply if you determined you need one!) and carefully check for leaks on the supply. Then, after your tank fills, check for proper tank level and adjust if necessary (see fill valve). Flush the new toilet two or three times and make sure your tank to bowl connection is leak free. If you want to caulk the bowl of the toilet to the floor, I will return here soon to add a link to a “how to caulk” page.